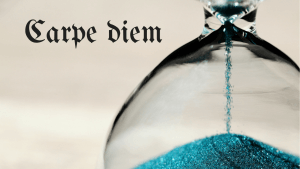 Carpe diem: seizing the day in the face of opportunity – and death! At some point during secondary school, aged 12 or 13, I discovered the phrase carpe diem. There was something incredibly appealing about the idea of SEIZING THE DAY, doing what you want, not wasting time – and it was in Latin, giving the idea a certain gravitas! Somewhere along the way, though, carpe diem has become a cliché, an overused slogan that no longer makes you think about what it actual means. This was the topic of the Sunday Sermon I went to at The School of Life last week. I’ve been following The School of Life for some time but it was the first event I went to: a talk by Roman Krznaric presenting the key ideas in his new book, Carpe Diem Regained: The Vanishing Art of Seizing the Day. I seized this opportunity, having read his book How to Find Fulfilling Work back in 2013 as I first started considering a career change. Probably most of us would think of this when we think of carpe diem, in the sense of jumping on an opportunity when it comes along, whatever your fears and the possible risks. Unfortunately, most of us are naturally risk averse, so we tend to focus more on everything that could go wrong than on all the things that could go right – thereby often missing out on something that could have been amazing. The mindfulness movement would focus on this interpretation of being in the here and now, living in the present moment. However, Krznaric pointed to one of my long-time favourites, Viktor Frankl, and his book Man’s Search for Meaning in which he argues that it’s not enough to live for the moment but that you must live for the future, to strive for some greater meaning. This is a tricky one in a world in which we all suffer from busy syndrome, with packed schedules and inflexible deadlines. Krznaric pointed out, though, that this lack of spontaneity dates back as far as the Protestant Reformation – during which carnivals and summer fairs and public dancing were banned – as well as the Industrial Revolution, with its increasingly regimented life according to the factory clock. Funnily enough, Krznaric admitted that he has to plan spontaneity on Sunday afternoons – a contradiction in terms, perhaps, but also a smart way to leave some space for some spur-of-the-moment decisions and unexpected activities. Carpe diem might also be said to support the case for indulgence, sensory pleasures, free love and gastronomic experiences. Here Krznaric referred to the puritanical streak that we see today in self-help books and a push for moderation and self-control, except perhaps in TV watching where we’re happy to binge watch Netflix with no holds barred. Krznaric’s final interpretation of the phrase was in the realm of politics, where great change can be brought about not through institutional acts but via unpredictable and spontaneous action of the masses. As he said, this is the phrase in its plural form, carpamos diem (- I never studied Latin so I’m a touch fascinated and impressed by this kind of talk!). Krznaric sees this desire to carpe diem as coming from the two existential drives of freedom and death – and this is consistent as much with my own thinking now about life and meaning that has emerged from my coaching work as with my scribbles on my notebook back at secondary school. There’s a strong human desire for freedom and the understanding that we are in control of our actions, our own destiny; but it’s the knowledge that we are going to die at some point that gives us a framework for that freedom, a sense of urgency and motivation. In this context, Krznaric referred to the famous speech by Steve Jobs at Stanford back in 2005. If you haven’t seen it, and even if you have, I’d encourage you to watch the whole thing; the piece on death starts at 09:04. Now, it’s not about living as if today would be your last – if you did that, you’d never work hard at anything, you’d never achieve any big and meaningful goals in your life. But remembering that life is fleeting, that, as Robin Williams’ English teacher in Dead Poets society would have it, “We are food for worms, lads,” is what helps you to focus your time and energy on what really matters. When was the last time you truly seized (or plucked, or harvested) the day? In which of the five areas above do you feel you might have a deficit? And what actions could you take – today, tomorrow, next week – to do more seizing? In my case, I’m more than happy to embrace my hedonistic side! And I’m already working on being more spontaneous and intuitive (yes, these things do tend to require a bit of practice and effort sometimes!). There’s no better time to seize the day than now! Especially here in the northern hemisphere as the sun is coming out and we have an opportunity to go outdoors and see, feel and experience the gorgeous world out there. Why Disney brought us up on a lie – and I’m not talking about the princes! Those of you who know me will know that I have a long history of Disney princess fandom. I grew up on what for me were the classics: The Little Mermaid, Beauty and the Beast, Aladdin… Then when I was a little bit older came The Lion King, Pocahontas, and Mulan. “I want much more than this provincial life! I can’t tell you how many times I swirled around singing this song to myself (and to any poor, unfortunate souls who were close enough that they could hear me), earnestly relating to Belle’s feeling that there was more to life than my provincial existence of school and homework, and dreaming of adventure. And, of course, it wasn’t just Belle. Another of my favourites is Ariel’s “Part of Your World” (although in The Little Mermaid our heroine has fallen in love with a prince based on looks alone and decides she’s happy to change species and give up her voice in order to win his affection – no matter), and what about “A Whole New World” where a handsome ‘diamond in the rough’ comes along and takes me on a magic carpet ride. So, yes, I grew up wanting adventure in the great wide somewhere, feeling misunderstood, and knowing I was meant for something bigger – but that’s not the lie, there’s nothing wrong with fantasising about all the exciting things you’re going to do. The big deception instead comes from what happens next and, ultimately, the “happy ever after”. Belle goes off and has her adventure, she frees the castle from its spell and falls in love with the Beast, who turns out to be a handsome prince, yay! Ariel and Eric together rid the world of Ursula the Sea Witch and then get married on a lovely cruise. Aladdin frees the Genie and marries the princess, despite not being a prince. Ta-da! And they all lived happily ever after. But what happens after the film has ended? Is Belle going to be satisfied now marrying the prince and living out the rest of her days in a castle, which, by the way, is just a stone’s throw away from her provincial little village? Will Ariel and Eric really be happy together as man and wife, given that they barely know each other? Will Aladdin the street rat be comfortable in the big palace, and will he and Jasmine be content with ruling the kingdom without the freedom to travel the world? 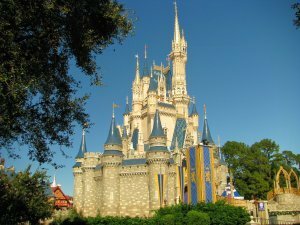 The finality of a magical Disney film ending – or, maybe, most film endings – gives the illusion that you are destined to do this one thing, and once you find it you’ll settle down and live out your days in perfect contentment. And THAT is where I think they have it all wrong, and where we’ve all been sadly misled. Generations X and Y are said to be purpose-driven, entitled and impatient. We’ve been told by our parents that we are special and we can do anything, we’ve launched ourselves out into the world to find our purpose… and then? We search for our dream jobs, travel the world to find exciting experiences and, yes, we scour the universe for our prince charming, our ideal partner. But how do we know that we’ve found it? And what happens next? There’s no theme music that starts playing as we achieve our one true purpose, no credits rolling once we’ve reached our goal. I suppose it’s natural that these princesses are all destined for greatness – a whole film has been made about them, after all. That’s part of the deception, though, that we believe that we are special and destined for some magical calling that no one else can do. 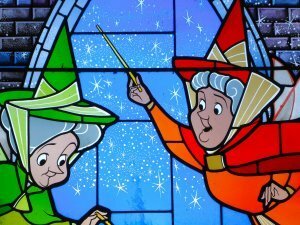 The lie is not that we’re special, because we definitely are; it’s just that we ALL have the potential to do something unique and impactful, we can all create magic – even without a fairy godmother – and that magic can take many different forms, there’s not just one true calling (or one prince charming). The latest Disney princess Moana, the South Pacific girl who yearns for the ocean, is reminiscent of all her predecessors as she dreams of greater things. She’s also specifically chosen by the ocean to save her island and her people, and so she’s special and unique versus the rest of the village, with a clear purpose to pursue. Where this film differs, though – *possible spoiler alert* – is that it ends not with her settling down and living out the rest of her life without adventure, but with a closing scene that sees her and her people rediscovering their voyaging ancestry and heading out onto the ocean to new and on-going adventures. And that’s how I think we need to approach our lives and our goals, whether we’re talking about that dream career or the dream partner or any other big objective that we aspire to: as one of many adventures, as a project after which there will be other projects, as just one step on the journey. Because if you think you’ll be happy and content once you find It (or Him or Her), if you think the film credits will roll once you’ve completed your life purpose… then you can only ever be disappointed and, ultimately, unfulfilled. As we come to the end of March, it’s time for the usual quarterly review of my annual theme. I share this process in the interest of transparency as to what I’m up to and to help you if you want to go through the same review on your own theme. Three months, or 12 weeks, is a good length of time – in fact, it’s the time frame I’ve put on my most popular coaching package, and it’s also the subject of several books, such as The 12-Week Year. My theme for 2017 was “impact”. It felt like a powerful and important direction to set for the year, albeit an ambitious one and something that is quite tricky to measure! What does “making an impact” even mean? Before getting to my own definition of impact and how I’ve been getting on, I thought I’d explore what lies behind this idea and why it’s something that I think a lot of us strive to achieve. Essentially, having an impact means making some kind of difference, contributing to the world in a positive way. And when we think of making a difference in the world, I believe we naturally think of professions such as doctors, teachers, firemen, social or charity workers; or, more globally, working in the United Nations or in a non-governmental organisation. However, there may be other ways to even make a bigger impact, via career paths or roles that are less obvious and also a better fit for you personally. A fantastic resource that I’ve discovered to in this area is the 80,000 hours website. Their advice on how to make an impact with your career – 80,000 hours is the time they estimate that you’ll spend in your life working – is based on research that’s been done at Oxford. How can you make a big impact? For maximum impact, you’ll want to find a problem that’s large in magnitude and with a significant effect on people’s lives, and ideally a corresponding solution that will really have long-term benefits. A powerful example given on the website is the comparison between the effect of leaving your mobile phone unplugged (a saving of perhaps 0.01% of personal power usage) versus installing home insulation (with a potential impact on climate change of 100 times as much). If it’s a high-profile area, it may be that a lot of people and resources are already allocated to working on it and the impact you as an individual will have may be minimal, as a result of diminishing returns. On the other hand, if it’s a neglected area, are there sound reasons for why resources aren’t being allocated to try to address this problem? You’ll need to do some research here, and perhaps talk to experts, to understand whether it’s feasible to make a real difference and to make progress in this area. Are there effective solutions available already with strong evidence to support their efficacy and will you be able to implement them? This last one is of course what we’ve been talking about in the last sections, and ultimately what the whole book is about. Are you motivated to work on this problem? Is the nature of the work a good match for your skills and experience? Does the day-to-day routine of this type of work fit with your “hygiene factors” such as commuting, travelling, and so on? Of course, this is not to say that problems that don’t have these qualities are not worth working on, and you may have a very strong personal reason for wanting to dedicate yourself to something smaller and more local; but when it comes to making the biggest possible impact on the most pressing problems in the world, these are interesting criteria to consider. However, the easiest, and the most effective, way to make an impact in the world might be unrelated to what you do at work. The most straightforward approach to making a difference could be to take a job that is a good match for you in other ways – consistent with your values, a fit with your basic requirements, a good use of your skills and strengths – and then to donate money to a good cause. The guys at 80,000 hours recommend donating 10% of your income to that cause – using those criteria above to work out what the cause should be. This may sound like a lot but if you are doing a well-paid corporate job, for example, then giving away 10% of that salary will still leave you with a lot more disposable income than choosing to work in a less well-paid sector and role such as teaching or charity work – all the while actually having a larger impact, according to the numbers. If you’re interested in learning more about how you can start contributing some of your salary, then do check out the Giving What We Can website, which also has a quiz that will tell you how rich you are compared to the rest of the world (- if I earned just £10,000 per year, that would still put me in the top 12% globally). Now coming back to my own New Year’s Theme, I must admit that I wasn’t really thinking in these global terms back in January. Instead, I was rather looking to make sure that the work I was doing was the right kind of work, and that I was effective in doing it. When you’re a solopreneur or freelancer, it’s easy to think that you don’t need a clear brand pyramid or business model. However, if you don’t have a vision for your business, or a clear idea of what value you’re creating and for whom, then it’s likely that you’ll be doing a lot of busy work that isn’t really creating any real results. With that in mind, I’ve been doing a lot of mind mapping and business modelling by myself as well as bouncing ideas off with my coach and other trusted friends. It’s also very easy to fall into the trap of wanting to help everyone and therefore ending up with quite an all-encompassing and, therefore, generic plan, and so I’m doing a lot of work on really tightening this up and keeping the focus on where I know I can make, and want to be making, the biggest impact. I haven’t made huge changes to what I’m working on – I still have my blog posts, my individual coaching, my article writing, my book, my workshops, and so on. Instead, what has changed is the way in which I’ve approached it all and how I’ve structured my week. I have a much clearer plan of the outcomes I’m aiming for each month, and what I need to do in terms of actions in order to achieve those outcomes. This has meant focusing more consciously on business development and exposure-generating activities, alongside the income-generating projects that I’m doing. Tracking this on a monthly and quarterly basis is helping me to really stay on course and pick up on any red flags before it becomes a problem. In terms of reaching more people with my message, one way in which I’ve been doing this is via speaking at schools. By sharing my career journey to date as well as giving my advice to them, I’m hoping to be able to make an even bigger impact in these young people’s lives as they go out and make their first career decisions. I’ve done three events so far, with one more to come next month, and the feedback has been incredibly positive (plus, I’ve had fun!). I have of course been continuing my career coaching, through which I support individuals who are looking for more meaning in their work. In addition, I had the opportunity to come in and work with participants on the Police Now graduate programme, a scheme based on the Teach First model, which encourages smart graduates to give their time to low-income communities at the start of their careers. I’ve also been applying my marketing expertise via business consulting and coaching to solopreneurs and startups who are working on making their own impact in the world. I’m far from having a massive impact either locally or globally, but I feel like I am making progress on the very small scale of my personal impact; and I will maintain the focus over the rest of the year! So how have you been getting on with your theme so far in 2017? Did you define exactly what you meant back in January and, if not, can you do so now? Do you feel like you’re on track considering the results you have so far in the first three months of the year? What do you want to, or need to, do differently next quarter? I’d love to hear how you’re doing on your theme this year, either in the comments here or you can send me a note directly if you’d prefer to keep it confidential. Good luck with Quarter Two! When faced with a big career or lifestyle choice, we can become completely overwhelmed and find it impossible to make any decision at all. We consider every possible implication, we gather as much information as we can, and we talk to other people in the hope that someone will tell us the “right” answer. Today, we’re faced with many more decisions like these, as we’re questioning things that used to be taken for granted – if and when to get married or have babies, buying versus renting, changing mid-careers, and so on – while getting an unprecedented glimpse into other people’s choices via social media. The funny thing is that smaller, quite trivial decisions can be paralysing as well. We may agonise over which restaurant to go to, which dish to order when we get there, or maybe which film to watch on Netflix. Now I’ve read that there are two kinds of people when it comes to making decisions. First, there are satisficers: these lucky individuals will make a decision once a set of criteria is met. Those criteria may be demanding, so it’s not that these people are “settling” necessarily, but they’re simply satisfied once they find what they were looking for. Then there are maximisers: these people want to ensure that they make the absolute best choice, so they might wander up and down the street until they’ve looked at each and every restaurant menu, or spend hours reading reviews on Amazon. , in which he argues that it’s the satisficers who are likely to be… well, more satisfied! Schwartz questions the assumption that more choice means more freedom, which in turn leads to greater welfare. He points to two negative consequences from all this choice: (1) it makes it harder to make any choice at all; (2) once we’ve made the choice, (a) we’re less happy with it because we worry if maybe the alternatives would have been better, (b) there are always opportunity costs, i.e. benefits that you’re missing out on because you made this particular choice (FOMO! ), and (iii) our expectations escalate as we think that with so much freedom and choice we should be able to make the perfect choice. If we don’t make the perfect choice – well, then, that’s our own fault! I can see some truth in this: taking away the need to decide can give you a sense of peace and help you to simply go with the flow, removing all sense of responsibility and blame. It’s the same with the stories I’ve read of people who’ve turned to dice to make important decisions, or committed to saying “yes” to everything for one year – it can be quite liberating. Philosopher Ruth Chang has dedicated her research to understanding how to make hard choices, and she explains that choices are most difficult to make when the two (or more) options are both good, just in different ways; so no alternative is actually better than the other overall. We may think that we just need more information and then we’ll be able to decide, but this fear of the unknown in fact rests on a misconception that we’re not smart or informed enough to make a decision – which is why we often take the (in our eyes) least risky option. The truth is: there is no best option! So we shouldn’t be looking for reasons “out there” that will tell us which is the right choice, but rather we should look inside of ourselves to create those reasons for ourselves. What Chang means by this is that we create stories as to why one decision is better than another, in a way post-rationalising so that we feel better about a particular choice. We tell stories, convincing ones, around why we chose a particular career path, or a house, or a partner, making one alternative better than the other and therefore helping to reassure us that we’ve made the right choice. So here’s the good news: there is no right choice. Hurrah! That should take some of the pressure off, and prevent you from conducting a never-ending search of information or advice that will magically tell you which is the right decision. Whichever path you take, you will find a way to explain it to yourself and to other people, so that it becomes the right choice for you. That being said, it’s in these decisions, these stories that we create, that we define who we are as individuals and what kind of life we will lead. Am I an adventurous and independent soul who is willing to take a risk and do something different, even if it means a few raised eyebrows from my current social circle? Do I choose the less risky choice of the status quo and stay in a comfortable job where I know what I’m doing and I have my daily routine, stable relationships, and above all a regular salary? Am I a lawyer or an artist, an employee or an entrepreneur? A singleton or a wife, a father or an eternal bachelor? I actually don’t find those latter labels particularly helpful, as we are more than one thing, more than just a noun, and identifying ourselves with such an explicit category simply gives us an excuse to act in a certain way. Humans are inherently adaptable, our brains scientifically proven to be plastic, and although we may think that we are what we are and we’re unable to change, that’s simply not the case. The point, though, is that our decisions are what make us who we are – so make those choices with care! on Amazon or watch the Ted Talk. Now aside from reminiscing about how rubbish my splits were, I’ve also been talking to my business coach about how to get even more focused in what I offer as a coach; and she picked up on the fact that I tell my clients that I’ll be their “cheerleader” (along with other things like a sounding board and an accountability partner). For me, since I first started to experience coaching myself, this “cheerleading” aspect has always been really important. The reality is that the world in which most of us are operating is overwhelmingly negative when it comes to taking risks and choosing a more alternative path. Teachers, parents, ‘society’, peers – most people are risk averse and when you talk to them they will voice their own concerns and speak from a place of their own fears and insecurities. This negativity is not just external, and in fact our inner critic can be the loudest voice of all. So for me, the positive, smiley, “you’re awesome!” cheerleader vibe is rare but much needed as we embark on major changes in our lives. It’s a voice that acknowledges your desires, takes your dreams seriously, and doesn’t ask you why you want to do something but supports you in working out how you’ll do it. This is not about being naively positive about ridiculous ideas. There is a time for being pragmatic, for recognising obstacles and working on minimising risks; but the point is that someone is always going to make sure that you see the negative sides of an idea – so what you need to do is make sure that you find someone to help you see the positive! When we’re little, adults will tell us that we can do and be anything we want. They’ll admire our magnificent artwork, watch our singing and dancing performances with rapt attention, and gush about how wonderful we are in every way. Somehow that gets lost as we grow up and become adults ourselves. But that doesn’t mean we need that support any less! So my tip to you: find someone who will be your cheerleader and provide you with unconditional support in amidst all the other negativity swirling all around you. The cheerleader can be a personal life or business coach, or perhaps mentor; it can be your partner; or it can be a good friend. Just find someone who will wave those pom poms and never stop smiling as they cheer at you from the sidelines. Wooooo! You can do it! Gooooooo you! Working on a big project and need a boost? Let me know in the comments what you’re up to and I’ll give you your own personalised cheer!